arlo and roxy getting bigger... sunday night we went to patrick's house to play with luke and winston (patrick's dog is luke - 8 month old lab and ashley and brent's dog is winston - same age and also a labbie)... they were ginormous and our puppies were scared. it was hilarious. 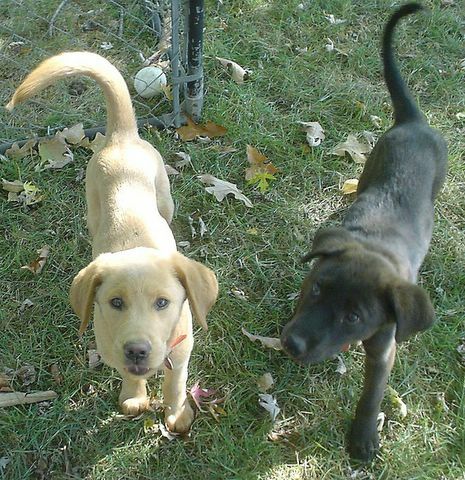 they looked a lot like arlo and roxy (winston is dark like roxy and luke light like arlo) doggie dates are fun(ny). what sweet babies! aaaahhhh must come visit soon! I can't wait to meet them tomorrow. We're still on for lunch, right? Naughty Little Caesars? Thanks Kat!!! I'm super excited!!!!!! I will be asking for tons of wedding advice! !